An intuitive wireless burglar alarm with smartphone monitoring and touchscreen control panel. The alarm components are pre-linked making installation easy to complete on a DIY basis and have a wide 80 metre wireless range (in open field conditions) using a 433MHz frequency, ensuring you can place them practically anywhere. The ERA Invincible Alarm is a dual network telecommunicating alarm with integrated mobile phone technology and is operated by a touch screen control panel, which incorporates a SIM Card holder and allows communication directly with the control panel. In addition, the alarm system can be operated via a Smartphone App, one of the included remote controls and can be disarmed by one of the RFID Contactless Tags. When the alarm is triggered, a loud siren will sound from the control panel to alert others of an intruder and the system will also alert you via a phone call or a text message. All the wireless components are linked together straight out of the box. 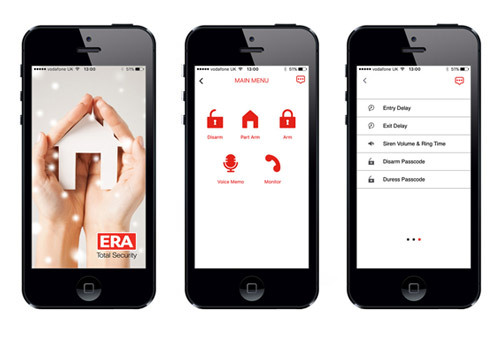 There is no technical knowledge or wiring required to install an ERA wireless Home alarm.